Okoawo BlueGate: " I killed her because she refused to marry me" Raphael Effiong.
" 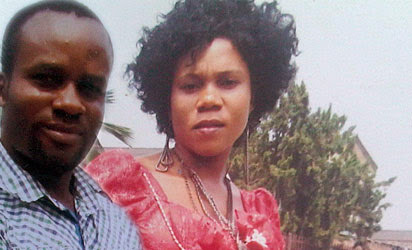 I killed her because she refused to marry me" Raphael Effiong. One Gift Sunday, a 26 year-old girl, who lived at Ketu , Lagos, has been stabbed to dearh by Raphael Effiong, her boyfriend for refusing to marry him. The sad incident took place on Monday, July 28, 2014 at Mayor guest house, the usual redenvoue of the lovers. According to Anietie family who late Gift stayed with, the deceased left home around 8.30pm, shortly after their dinner. But apprehension reportedly set in when she did not return by midnight. Tension, heightened after efforts to reach her on the phone proved abortive as it was discovered to be switched off. Next day, the family’s fear was confirmed following the visit of a woman later discovered to be a management staff of Mayor Guest house located at 10 Yusuf Eleran street, Ketu. The woman was said to have invited Gift’s sister , Mrs Ume Anietie to Fine Day hospital at Elebiju street, where she was informed that Gift had passed on! Gift, as gathered, was stabbed in the arm and breast by her boyfriend, Raphael at the guest house. A man who claimed to have witnessed it all told Crime Guard that :“I was seeing a friend off, when I heard the shout of help from the hotel. I sensed all was not well and went to the hotel to inform the staff. They told me it was normal to hear lovers shout. But I insisted that the shout was not that of pleasure but of panic and pain. It was at that point that we all rushed to the room and forced the door open. To our disbelief, we saw a lady on the floor with a deep cut in her hand from where blood was gushing out. The man with her was holding a pair of scissors . At first ,nobody knew what to do. We told the man to take her to the hospital but he could not carry her because she was big in size. We all carried her outside with blood still gushing out from the deep cut in her hand. It took about 30 to 40 minutes before she was rushed to Fine Day hospital. Even when she got there, the doctors did not attend to her on time. It was not until the Police at Alapere division called and instructed them to commence treatment on her that they started attending to her and we left”, the eye witness narrated. Doctors at Fine Day hospital were said to have managed to revive Gift. In an inaudible tone, she was said to have told some of the hospital staff that it was not the first time Raphael would beat her . At a point, Gift could not reportedly speak, as she complained of weakness. Unfortunately, she could not owing to loss of blood.Had blood been transfused into Gift, she would have probably lived to share her ordeal,Crime Guard gathered. Raphael as gathered, attempted to escape, on noticing the magnitude of his action. But he was apprehended by staff of the hotel who handed him over to policemen at Alapere,from where he was transferred to the State Criminal Investigation Department,SCID, Yaba, Thursday. At the SCID, Raphael told operatives of the Homicide section that he stabbed Gift because she refused to marry him. According to the Akwa-Ibom State suspect:“I never knew she would die. I never meant to kill her. I only wanted to threaten her with the scissors. We have been going out for a year and I loved her so much … I proposed to her but she turned down my proposal, saying she couldn’t marry me. I have begged her several times to have a change of mind but she didn’t. I have invested so much on her with the hope of marrying her some day. But I never knew she was only deceiving me, by playing on my intelligence. I just could not stand her getting married to another person. The mere thought of that sends me crazy”, he said, begging the deceased’s family members to forgive him. But members of the deceased’s family are of the opinion that the act was preconceived, asking why the suspect took a scissors to the guest house in the first place. The late Gift, as gathered, was a fashion designer. She was said to have been living with her sister since 2005, from where she went to secondary school and thereafter, learnt fashion designing. Until her death, she was said to have sewn wedding gowns for different would -be brides, including those of their bridal trains,with the hope of sewing for herself someday. She was said to have boasted to close friends that she would make the best for herself when the time came, unaware that she would not live to witness the day. She had reportedly told close friends that her choice of husband was a God-fearing man, little wonder she accepted to go out with Raphael in the first instance , as they met in the church. But along the line, Raphael reportedly left the church, shortly after which he started demonstrating his battering tendency. The deceased’s elder sister , Mrs Anietie, who is yet to come to terms with Gift’s demise, said amidst tears: “ She was a very hard working lady. She was cheerful and was like a daughter to me. I will forever miss her”. Spokes person for the Lagos State Police Command, Ngozi Braide , said the suspect would be charged to court at the end of investigation.